Start the New Year off with a New Moon phase trim. Out with those old jagged ends, and welcome in the new hair growth that will sprout from your hair roots. New Moon phase trimming uses the energy of the moon to increase your normal rate of hair growth. People report their growth rate doubling and even tripling. SO WHAT WILL A NEW MOON TRIM DO FOR YOU? THE ONLY THING YOU HAVE TO LOSE ARE THOSE BAD ENDS. 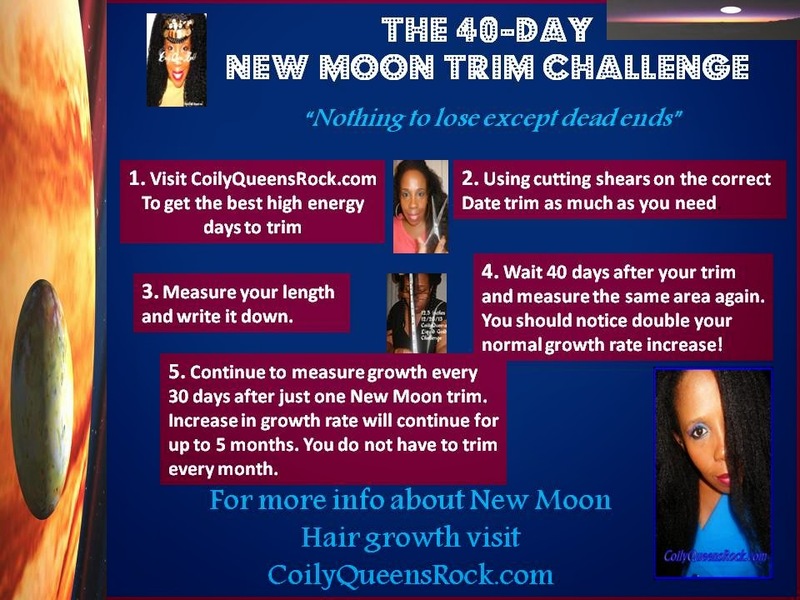 TRY THE 40 DAY NEW MOON CHALLENGE, YOU MAYBE SURPRISED AT THE RESULTS. My trim dates vary from the dates you may find on other sites. I have the best dates for growth increase, this is for sure. Want to know how I pick my dates each month? Hi, thank you for your very informative blog, my hair has improved immensely since I have been using your regimen! The only subject you haven't touched on though, is haircare for regular swimmers. please help. Thank you for the nice compliment. First I would recommend adding some leave in conditioner and using a swim cap. I know they are uncomfortable but that is the best way to keep the chlorine from drying out your hair. If that does not work for you then you are left with no choice but to wash and condition your hair after each swim. If you choose not to wear a swim cap then I would add some leave in conditioner and a little grease. The grease will help against the chlorine a little. Then immediately rinse your hair after swimming. When you get home wash with a conditioning cleanser and apply a leave in. Try the black soap deep cleanse by Shea Moisture. I really like the fact that you're also doing 2 months. This really helps me plan my cuts accordingly. Remember as previous articles have stated you do not cut every month. Yes, the problem really is that my ends are in serious need of Deliverance! I've cut and cut and cut and cut.... and to no avail... my hair has started tangling so much. No length retention just straight up mess. I'm revisiting my regimen.... Going back to the basics. I'm meeting up with a beautician next week, to help me properly cleanse and condition my hair. I'm officially throwing in my white flag, and calling on help.... my hair transition has officially begun! Also, is it a good idea to cut after every 40 days? And by transitioning attempt.... I'll be cutting approximately .5" to 1" every 40 days. And what I mean by transition since I'm already natural, I'll be transitioning from weak ... sad looking strands to thicker hair and ends. In your visit to the professional she will probably recommend just getting rid of the damaged hair in one cut. But yes you can cut a little at a time each month, as long as it is on the right energy day. I'll be doing the challenge trimming on Jan 20. I'm so excited to see the results! Thanks for sharing this information. Thank you! Much success to you!! This really helps me as I trim about every four months and I have been patiently waiting for February trim dates. Do the dates given work in all parts of the world..particularly UK. Hi, love your site, blog and facebook! Can I please have the dates for March 2015? Thanks. Hi when will march dates come out and I have learn a great deal from your site. please post March dates, i need a trim and want to trim and a would love to start using this method. How to repair heat damaged hair!